On the WiFi front, Ubuntu 12.04 LTS "Precise Pangolin" was a big disappointment for me. Nothing seemed to work until I started using an alternative network manager called Wicd. 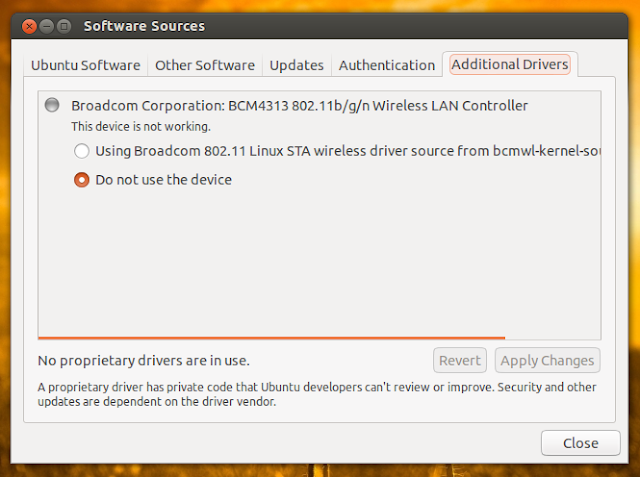 Things are slowly starting to get better with each new update in Ubuntu 12.10 Quantal Quetzal, but not there yet. So I went on to check for availability of any new drivers. I was in for a surprise. There was no Additional Drivers app in Ubuntu 12.10 anymore. As you can see, Additional Drivers is not a standalone application anymore. In its latest avatar, Additional Drivers functionality sits in a new tab inside Software Sources. I appreciate the determination of Ubuntu devs to minimize the number of core apps that is scattered all over the place. When you consider the fact that Software Sources app itself is accessible from Ubuntu Software Center, the whole thing makes a lot of sense. Even then, the sudden disappearance of Additional Drivers app can cause confusion to experienced users. So what do you guys think? Share you views.